One of the biggest advantages of automation technology is that it can turn an otherwise lifeless home into a piece of modern technology. Also, smart technology puts the owner in control of their electronic devices such as lighting, entertainment and temperature at the push of a button by just sitting on the couch. You too can enjoy smart life through smart connected homes. 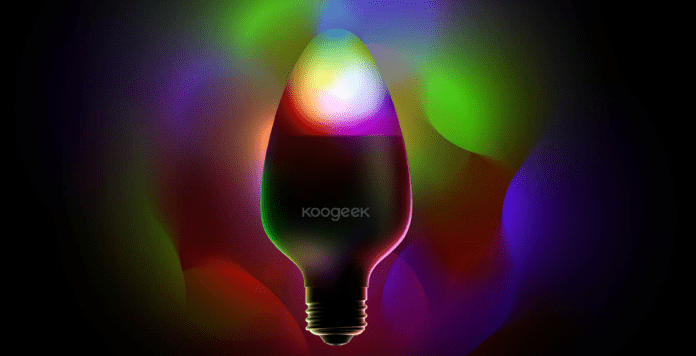 Koogeek has introduced its new HomeKit enabled Wi-Fi Smart LED Light Bulb that can be easily connected to a 2.4 GHz Wi-Fi network without a hub or bridge. It works with Apple HomeKit technology and provides an easy, secure way to turn your connected light on or off, set light colors, or adjust light brightness and saturation through Siri voice control on your iPhone, iPad, iPod touch, or Apple Watch. It supports dimming, shades of white, and color settings and offers 16 million colors to choose from. Every color is dimmable in the Koogeek Home app. You can match different colors to create special atmospheres for every moment and personalize your home. You can easily turn off lights with a single tap, without getting out of the comfort of your bed. It uses only 8 watts and delivers up to 500 lumens of light with a color temperature from 2700k (warm white) to 6000k (daylight white). It has an energy saving with a lifetime of up to 25,000 hours, which is 22.8 years based on 3 hours use per day. It is compatible with E26/E27 light fittings (medium screw base) and is for indoor use only. You need to no longer worry about forgetting to turn off lights while leaving home, as you can set different timers to turn lights on or off on Koogeek smart light bulbs. You can also wake up in the morning with your favorite light turned on automatically. You can create scenes to control multiple connected bulbs simultaneously with a single Siri voice command or just a tap and customize lighting effects and create brilliant lights for parties or festivals. To set up the light bulb, you need to simply configure it from the Koogeek Home app over a 2.4 GHz Wi-Fi network. It is available in grey color. You can purchase Koogeek Wi-Fi Smart LED Light Bulb from Amazon at a price of $39.99. To know more about Koogeek LB1 Smart LED Bulb, go over to their official website.